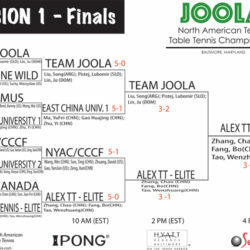 Check this link or download this PDF to see where your favorite teams stand at the end of our marathon weekend of table tennis and fun! Today’s results are in. Check this link or download this PDF to see where your favorite teams stand at the end of our marathon weekend of table tennis and fun! Download this PDF with all the results from the matches played on Friday.